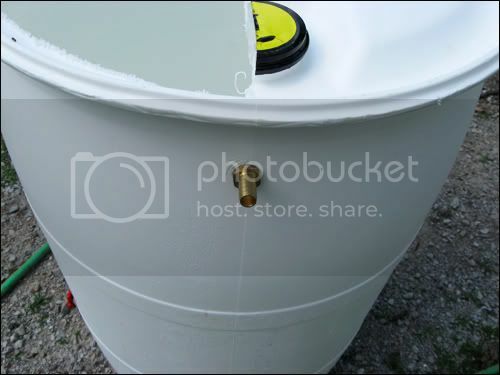 How to Make a Rain Barrel | Ultimate Money Blog- Save Money and Live Green! For awhile now we’ve wanted to harvest our rainwater from our roof. 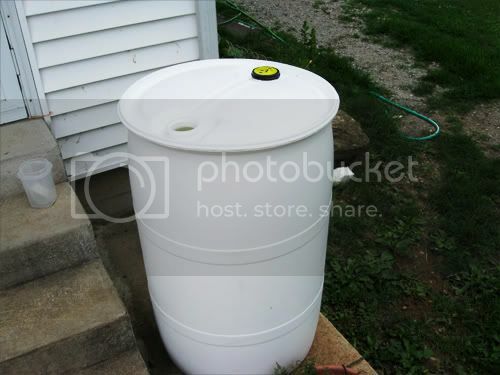 I’ve been checking out various places online and it seems 55 gallon rain barrels normally run at least $100. Yikes! Of course I decided to research the best way to make our own, and was on a hunt for some food grade plastic barrels. While I don’t think plastic is the best, I figured that at least I could recycle a plastic barrel and stop it from going into a landfill. You would think that because Mr. Money is a chef, he’d have easy access to a 55 gallon food grade barrel, right? I did too. It turns out they are harder to come by than I thought. 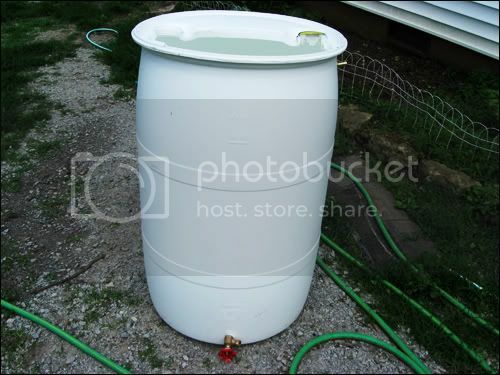 I started searching Craig’s List for a rain barrel, and about a week into my search I came across some 55 gallon drums that had been storing soda syrup (ours had Mountain Dew in it). The company is located about an hour and a half from us, and luckily Mr. Money was attending a food show close to there and would be able to swing by on the way home and pick up a couple. They were $15 each. Score! Here’s how we (Mr. Money) transformed our boring barrels into raging rain receptacles. First, cut off half of the top with a saw. Then cut out a hole in the bottom (where the spout goes) with a drill and a hole-cutting attachment. The screw the spout in, remove it so there are threads, and then put it back in and caulk it. Next drill another hole near the top and put this overflow valve. One of the last steps is to add netting to the top, secure it with a few pieces of twine, and you are good to go. Don’t forget to add your netting otherwise mosquitoes will make your new rain barrel their breeding grounds! Gross. The last step is to make sure it’s on level ground, cut off your downspouts, align, and wait until it rains! Voila! What’s your opinion on water conservation? I’m curious for what purpose the rainwater is going to be used. If it’s for watering the garden and such, this is a brilliant idea. I’d be very hesitant to drink it unless you put it through a purifier of some description. Are you planning to collect the water from the downspouts? I’d like to get a few barrels but of course LA gets very little rain so I’m not sure it will be much use. I need to design a dew collector, we do get fog quite often. Very cool construction of your rainbarrel. I wanted to create/buy a rainbarrel for our home, but it turned out not to be a good idea for us because our home’s roof is made of asphalt shingles. Apparently, the rainwater that comes off those shingles gain a toxin that makes it unsuitable for vegetable gardening—-but okay for regular ornamental plant irrigation. Thanks! I have never heard that it was not good to use the rain water for the vegetable garden. Now I’m scared about putting that water on our vegetable garden! Yikes! A word to the wise. 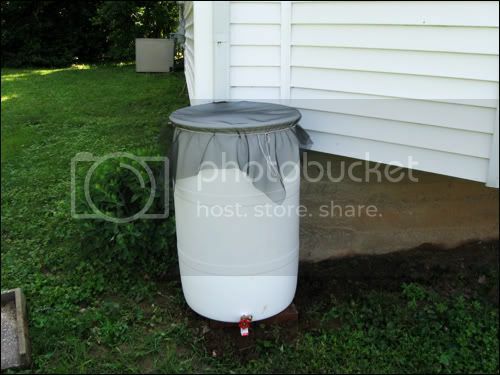 Should you decide to utilize a rain barrel for rainwater harvesting remember that water in the barrel is only as clean as the gutter it drains from. I realize that cleaning rain gutters can and often is a dirty, nasty, job none of us enjoy doing. However, I invite you to visit me at http://www.GutterClutterBuster.com and see a newly invented gutter cleaning tool that makes gutter cleaning a breeze! And, you save money while you clean. This new gutter tool is a safer, cleaner, and easier method of gutter cleaning than any tool on the market today. Keep those gutters sparkling clean and your rain water cleaner. 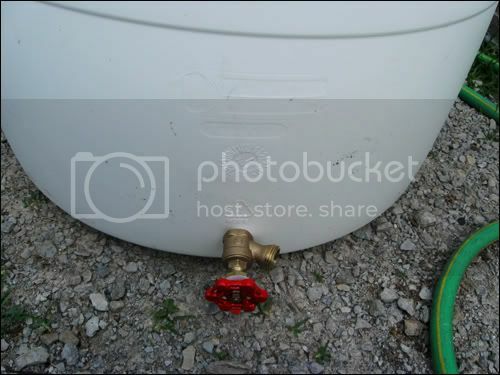 Consider connecting several rain barrels together for collection of overflow from the first main barrel. Complete instructions to do this can also be found on line at watershedactivities.com. Thanks for the comment on my blog. I hope you hubby can be persuaded into loving hens someday. Maybe he just needs a little experience with them first? I think he would love them if we got them. I’ve just got to convince him now! Hi there … how quickly do you have to use the water before it goes stagnate? Can you actually save it for a dry spell or do you have to use it right away? Pingback: My Neighbors Think we're Hippies | Save Green and Live Green!